"e;Clearing the Ground"e;-The Field Day Theatre Company and the Construction of Irish Identities studies the Field Day Theatre Company, with special focus on the plays that they put on stage between 1980 and 1995; it attempts to dissect their policy and observe the way in which this policy influences the discourse of the theatrical productions. Was Field Day simply the "e;cultural wing… "e; of Sinn Fein and the IRA, or did they try to give voice to a new critical discourse, challenging the traditional frames of representation? This book focuses on a thorough analysis of the way in which Field Day applied the concepts of postcolonial discourse to their own needs of creating a foundation for the ideological manifesto of the company. 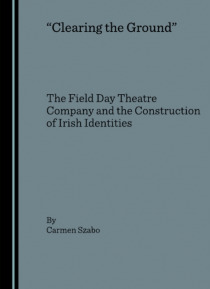 This study is a critique of the successes and failures of a theatre company that, in a period of political and cultural crisis, engaged in innovative ways of discussing the sensitive issues of identity, memory and history in Northern Ireland and the Republic of Ireland.